Because 2017 has not been a quiet year and changes in contingent labor impact pretty much everyone. Like most people on planet Earth, you’ve probably seen Finding Nemo (at least once). 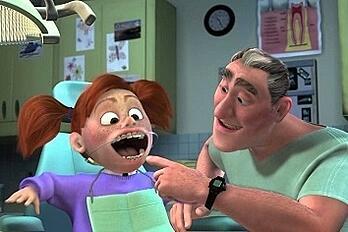 Remember the cringe-inducing dentist scene—90% chance the dentist was an Independent Contractor (IC). 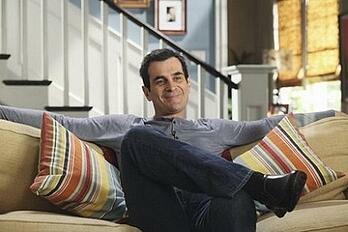 How about Phil from Modern Family? Chances are that he too, like 52% of all real estate agents and brokers, will also file a 1099. Maybe you're more of a Harry Potter type? In that case there's a 95% chance Rubeus Hagris, Keeper of Keys and Grounds at Hogwarts School of Witchcraft and Wizardry, wizarding world or not, is an IC. 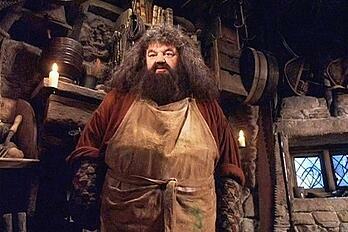 The point is contingent laborers are all around us (just look to some of our favorite characters!). They’re an increasingly vital part of our economy and their momentum is only gaining steam. Running a successful workforce program is not just about solving today’s problems, it’s also about preparing for future changes and challenges by planning ahead. If you’ve ever experienced that awkward moment when your boss, a customer or a colleague asks you about some news, or a trend in your industry and as you pretended to nod along, you’re secretly scratching your head, you get it. Bringing valuable solutions to the table starts with understanding the landscape around you. So get some positive attention for your great ideas, all you need to do is take few minutes to learn from an expert. When it comes to tracking the nuances of the current contingent workforce landscape while monitoring future changes our Senior Independent Contractor (IC) Compliance Specialist, Cindi is the real MVP. Safe bet: if Cindi’s tracking it, the rest of us should too. Read on to see what Cindi is tracking and the impact it can have on the contingent labor space. Subscribe and get updates straight to your inbox! #1 Immigrants will continue to be a vital part of the American workforce. Currently 13.5% of the US population are immigrants, making up 16.7% of the total workforce. 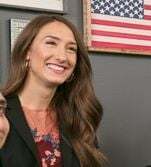 The demand for skilled workers is high, so it’s unlikely the H1-B caps will be decreased in the foreseeable future. However, President Trump, citing abuses of the H1-B program, signed an Executive Order titled “Buy American and Hire American.” The “Hire American” portion of this Order calls for greater scrutiny of the H1-B Visa program. #2 Aging Baby Boomers are staying in the workforce longer, but Millennials have taken over as the workforce majority. According to the Pew Research Center, 2015 marked the first year that the Millennial generation (generally defined as those born between 1981 and 2000) surpassed the Gen-X and Baby Boom generations as the largest proportion of the workforce. Currently Millennials comprise about 34% of the workforce. This generation is known to to gravitate toward non-traditional career paths, and employers that provide mentoring and growth opportunities (more details here). So employers may need to reevaluate their organization's standards and culture to ensure they're able to attract and retain top talent. An important demographic affecting the US labor force: Americans are getting older but working longer. 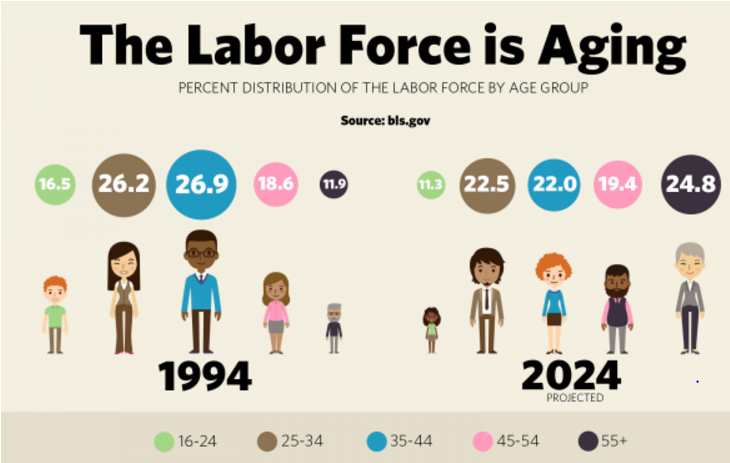 The Bureau of Labor Statistics (BLS) projects that by 2024, nearly 1 in 4 people in the labor force will be age 55 or over. Compare this to 1994 when only 11.9 percent of the workforce was 55 or over. The US workplace will continue to be a mix of full time, part time/temporary, on-call and freelance (1099) workers, and we can expect more of the latter two. This is largely because Millennials are more comfortable with non-traditional career paths compared to previous generations (i.e. non full time roles), and Boomers are working longer as contingent labors. It’s tough to measure the number of people engaged as independent contractors, or who are self-employed, but most recent estimates by Freelancers Union and others is between 34-40% of the labor force is engaged in temporary, non-employee work arrangements. From a different angle, this is important because independent contractors, the self-employed and those engaged in the freelance economy are generally very small businesses and therefore don’t have access to the lower-cost health care pool, often leaving them uninsured. Enter the Affordable Care Act, or Obamacare. CNBC reports one of five participants in Obamacare or the ACA in 2014, the first year the coverage was available, was a small business, self-employed, or both. So access to the required amount of health insurance will be increasingly important as more non full time employees enter the equation. Wages for Chinese workers have spiked to an equivalent of $3.60 US per hour, driving many companies to consider a return to the US. To retain control of labor costs, this return has been coupled with a heavy investment in robotics and technology. While some jobs are coming back to the United States—a process known as “reshoring”—others are still being sent overseas. The addition of jobs that are returning is not enough to stem the loss of jobs. One factor contributing to the loss in jobs in manufacturing is a change in the skills requirements for manufacturing jobs. The jobs in manufacturing tend to be computer based rather than assembly-line based. The trickle back of manufacturing jobs to the US will continue, but re-shored jobs will be fewer and require a different skill set than the assembly-line type jobs that were lost to offshoring. The story of the US is written, in no small part, by the risk-taking, hard work, intelligence and creativity of its labor force. Our workforce is dynamic, multi-generational, and among the most diverse in the world. Supporting and protecting the many valuable members of the contingent workforce is vitally important. If you work with independent contractors, or are considering it, make sure you’re maintaining compliance so you can enjoy the benefits of this labor model without taking on the risks that could cost you in the long-run. Cindi and Whitney partner on sharing valuable insights about contingent labor and independent contract. Both have a passion for learning and sharing the knowledge!